Importer Security Filing, or ISF, has been in effect since 2009. However, CBP only recently began full enforcement of ISF-5. ISF-5 is for cargo passing through the US in the form of Freight Remaining on Board (FROB) or cargo intended to move through the US under a Transportation & Exportation (T&E) or Immediate Exportation (IE) bond. It is called ISF-5 because there are 5 data elements required prior to vessel load, rather than the typical ISF – ISF-10. CBP published a rule on April 12, 2018 (effective May 14, 2018) which expanded the definition of Importer Security Filing (ISF) Importer for certain types of shipments. The changes were necessary to ensure that the ISF Importer included parties that have a commercial interest in the cargo and have best access to the required data. CBP is ending its delayed enforcement period for ISF‌-5 violations and will begin issuing liquidated damages claims for violations of the ISF‌-5 requirements on March 15, 2019. Filers will want to be compliant before that date to avoid penalties. Contact us today if you need to file ISF or are re-evaluating your current ISF solution. We have flexible, competitive pricing for anyone who needs to file ISF. SmartBorder will showcase its software suite at the 2018 WESCCON conference to be held at the beautiful Riviera Palm Springs. SmartBorder provides highly customizable software solutions for customs brokers, importers, and carriers. WESCCON allows participants to improve their business and career with workshops, panels, roundtable discussions and town hall meetings on timely topics. This year’s theme is Agents of Transformation – Mastering Changes in Trade. Attend and stay informed about the latest industry issues and trends. Schedule a demo with SmartBorder during the event by emailing us at sales@smartborder.com and see how our solutions can help your organization be more productive. You may have heard all the buzz about FTZs these days, especially with President Trump’s tariff changes. FTZs have become an increasingly popular way to manage costs during a time of unpredictability. Click here to learn more about FTZ e214. This function brings commodity line information in from a Microsoft Excel spreadsheet right into your SmartBorder customs entry. SmartBorder will showcase its compliance and logistics solutions at the 2018 NCBFAA Annual Conference to be held at The Westin Mission Hills Golf Resort & Spa. 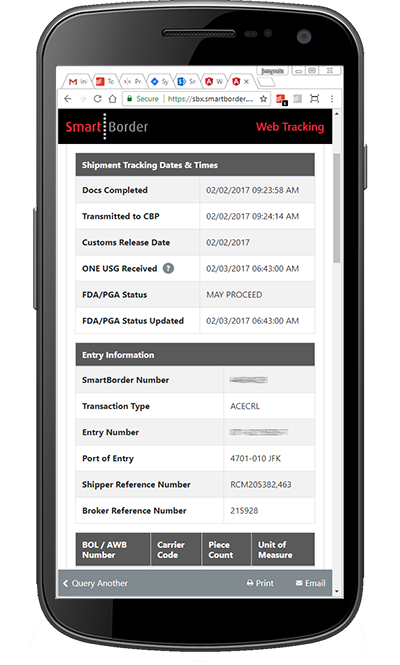 SmartBorder’s application suite provides a seamless integration between best-of-breed logistics and compliance software. The NCBFAA Annual Conference brings together more than 600 of the international trade industry’s top representatives from around the United States. For four days in Rancho Mirage, CA, the nation’s leading customs brokers, freight forwarders, NVOCCs, OTIs and service providers gather to update themselves on industry developments and to connect with colleagues new and old. Set your preferences such as logo, colors, size, and which fields to display. Click “Generate widget”. Verify the preview is what you want. Click “Copy code to clipboard”. This is the code you will need to paste on your web page. Done! An API is also available if you would prefer to completely customize the input and output of the web tracker on your site, further than what is possible in the builder, or integrate it within your current systems. SmartBorder is proud to once again be a gold sponsor the for the Fourth Annual Global Trade Educational Conference (G·TEC). The event held in Dallas, TX on July 30-31 is a great chance for those in the trade industry to learn about recent developments and network with colleagues. It is also worth 10 CCS/CES continuing education credits. Early bird registration is available until June 11th. Click here for more information and to register. Today we are excited to announce a major update on the SmartBorder redesign project. SmartBorder is proud to be a gold sponsor the for the Third Annual Global Trade Educational Conference (G·TEC). The event held in Long Beach, CA on August 7-8 is a great chance for those in the trade industry to learn about recent developments and network with colleagues. It is also worth 10 CCS/CES continuing education credits.